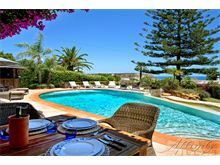 This very popular villa, located in a quiet cul-de-sac and only a 10 minute walk into the town centre, has something to offer everyone. 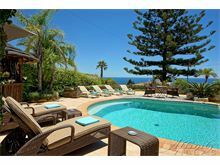 The outside areas are very spacious with both natural shade and covered terraces, a poolside bar equipped with a sink, panoramic sea views and an unusually shaped pool which is a most interesting feature. Should you wish to venture out, the nearby town has a good selection of restaurants and bars plus a beautiful sandy beach that offers watersports during the summer months. Electric gates open on to driveway with parking. Entrance hall, sitting room with flat screen TV, DVD and iPod dock and two sets of patio doors which lead to a covered terrace. 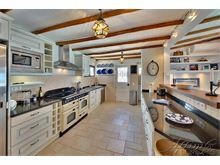 Kitchen with fridge, separate freezer, microwave, induction cooker and dishwasher. Master double bedroom with four-poster bed and patio doors to a covered terrace and en suite bathroom with walk-in shower and freestanding bath. 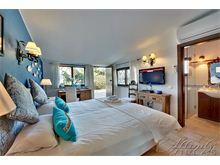 Double bedroom with en suite shower room and washing machine. 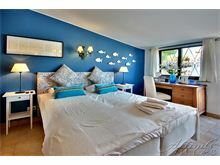 Double bedroom and separate shower room. A separate annexe, located by the entrance gate, has a twin bedroom with en suite shower room and TV for viewing DVD's only. 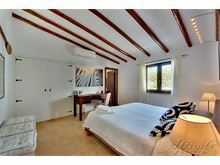 One air conditioning unit is provided in each room. Maid service 2 times per week. Pool heating, air conditioning and WiFi are available at additional cost, if required. The villa was everything we expected and more We all had a great holiday in beautiful surroundings. Great views, good location and good facilities. We had a fabulous holiday. Out of this world! What a memorable week spent at the beautiful Casa Mimosa in Luz. The house is warm and welcoming, beautifully appointed, immaculate and perfectly equipped for our every need. We had an amazing trip and will definitely be back! 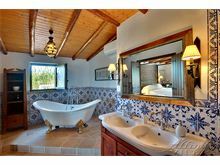 Casa Mimosa is a beautiful villa that is tastefully decorated and extremely comfortable. We felt completely at home and found we didn't want to leave, often eating in. The pool was perfect and the sun chairs were so comfortable. Nice shaded areas were available plus great eating areas. The kitchen had everything we needed and our favourite place was the outside bar area which became our 4pm cocktail area. One of the reasons we chose this villa was that it was close to a town so that we could sometimes get taxis to eat out so that one of us wouldn't have to drive. 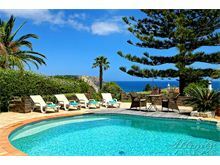 Would highly recommend Affinity Villas for the professional service and informative emails. 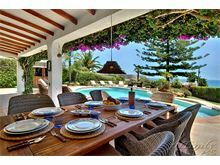 We stayed for one week at Villa Mimosa in Praia da Luz. 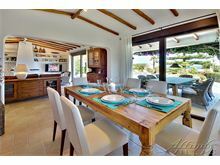 The Villa was absolutely superb with fantastic features including a wonderful swimming pool. We were a family of 7 adults and one baby, aged 1 year old and the facilities catered perfectly for us. 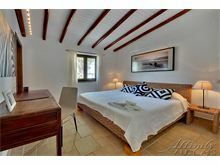 The pictures of the Villa were excellent and our expectations were fully met. Affinity Villas were an excellent company to deal with from start to finish and I am definitely looking to book with them again. Thanks you. 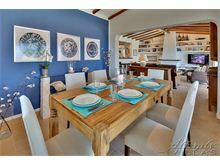 A beautiful, comfortable and homely villa, tastefully decorated throughout by the owners ...the photos are accurate but don't really convey just how spacious Villa Mimosa is. A very well stocked kitchen ( if cooking in on holiday is your thing!!) and the BBQ and bar make for great "man" territory. Great pool with views to match...what more could you want? Sun? ....plenty of that!! Cool breeze in the evening? That's pretty much guaranteed in Luz as are the fabulous restaurants. The villa was outstanding. Outside area was fabulous, brilliant barbecue area and outside bar, pool was very clean and large. 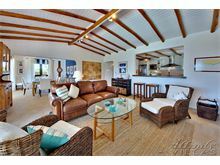 A ten minute walk away from restaurants and beach. Couldn't recommend this villa highly enough. 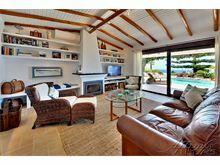 This house was chosen primarily for the poolside area and views, when we got there it was so much more. We had friends and extended family staying and so the three bedrooms and self-contained annexe were just right for our party. 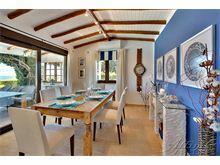 The house is beautifully decorated and is comfortable both inside and out. 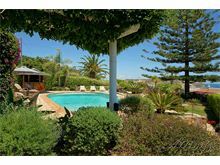 The pool area has gardens and an upper roof terrace and the view of the Algarve coast is sensational.Our towels were changed midweek and there was a maid service,cleaning the house once in our two week stay. Although there were wide screen televisions in most of the rooms, we only used the main one in the living room but there was so much else to do, even that was infrequent. There is a great barbecue and poolside bar on the property and all the facilities you would expect from a house that size.Walking into Luz took about ten/fifteen minutes (longer on the way back as it's uphill) and we did a fair share of sampling the local restaurants which were all very good.I would definitely recommend this villa. 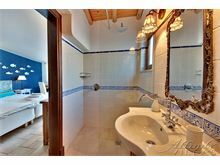 Fantastic villa with great facilities. The pictures on the website do not do it justice it was better than any of our expectations. We were a family group of 7 adults . 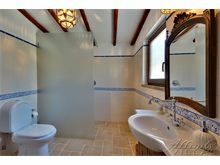 The bedrooms and bathrooms catered for all our needs and we're spotlessly clean. 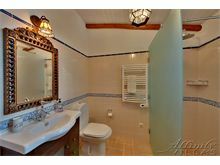 A mid week towel change and freshen up of the bathrooms by the maid was a nice touch. The villa is in a good position and the walk into Luz and the beach and restaurants took around 10 mins (15 mins on the way back as it is uphill!) We would definitely return in future and cannot express enough how much we enjoyed our holiday and the service provided by Affinity Villas both at home and abroad. Well done to Everyone! 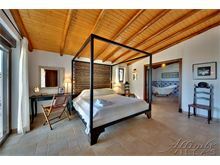 Villa Mimosa was exactly what we were looking for with our 2 week stay in Portugal! The outdoor space was lovely and having the pool heated was a real treat. The indoor space was very comfortable and nicely decorated - very much a home away from home. The location was fantastic - walking into town took about 15 minutes - so we were really pleased. 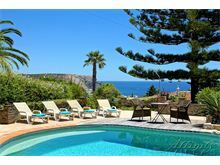 I would definitely go back to Villa Mimosa - it was a perfect spot for 2 weeks in the sunshine!